The phase of popularity of the tango today shows no sign of decadence and the charm of this rhythm has never been greater for the European public. The recording scene is an evident demonstration of this, and shows that this music, with its birth in Argentina, is undamaged by today's musical phenomenon: that of the contamination. 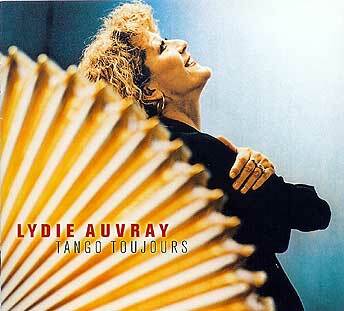 This new disk of Lydie Auvray is devoted to the tango and it has a very symbolic title " Tango Toujours". To make a CD of tango involves, for an affirmed musician and one so well known as Lydie, many choices and potential problems. The first is the problem of comparison with the Argentinian traditional tango and then, above all, with the Nuevo Tango of the great Astor Piazzolla. There is also the experience of the tango-song (we think to Milva or to Horacio Ferrer). This choice completed by Lydie Auvray has been, to me, a very correct way to look at this past, to not abandon the style or the personality of the tango. I believe that you will appreciate these motives. None of the 14 album tracks are sung and I believe, that this is a CD of European tango as it is correctly termed in the notes of the CD booklet. In this recording, the personality of Lydie emerges and also the why, after all - this is the whole reasoning, why this CD is no "contamination". The fourteen tangos of this CD are all very pleasant ones, desirable, even if not sung "songs" since they are very rythmic yet also melodic. They are all written by the accordionist leader (Lydie entitles the CD in the booklet "My Tangos") and also, the CD has an unmistakable stamp - in all the passages of the leader. In another critique I have already spoken of the sound of Lydie as a real sonorous identity. To enrich the sound of this band (Die Auvrettes) there is the presence of the quartet of arcs "Indigo" where everyone is female, and in this case, also the role of special guest. The choice of the quartet of arcs is very functional to the sonority of the " tango's" and the arrangements of the arcs (of the pianist Wolf Mayer) they result in "content" aiming for a lot of sound color rather than rhythm only, utlising the group consisting of piano, guitar, bass and drums.